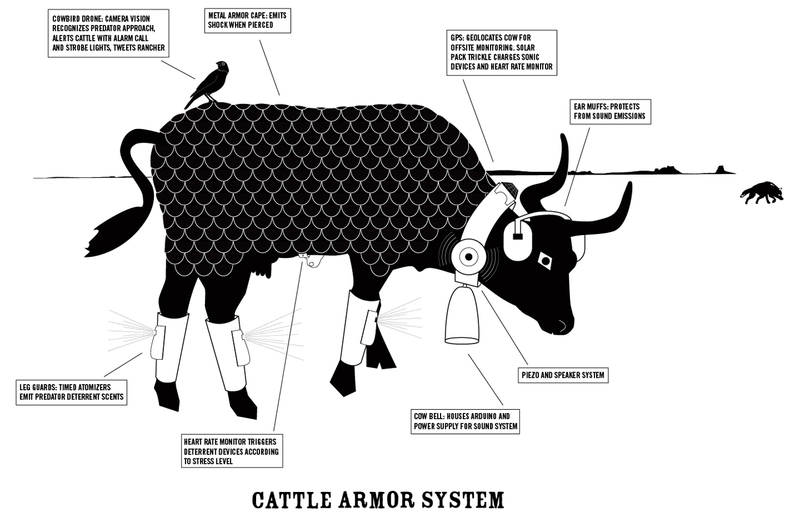 Gila 2.0: Warding Off the Wolf consists of a “cattle armor system” of predator deterrent devices focused on the wolf based on aversion and deterrent research conducted in animal cognitive behavior and predator control. 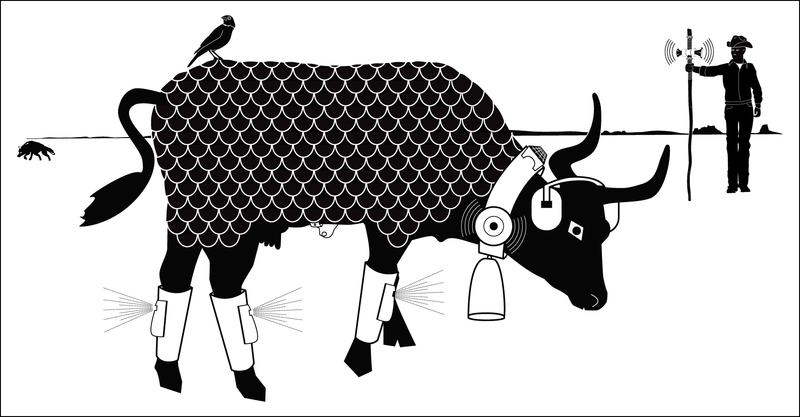 Our research and design propositions offer a self-defense system for cattle using GPS, sound and olfactory output devices, video sensing, surveillance, and two-way communication. 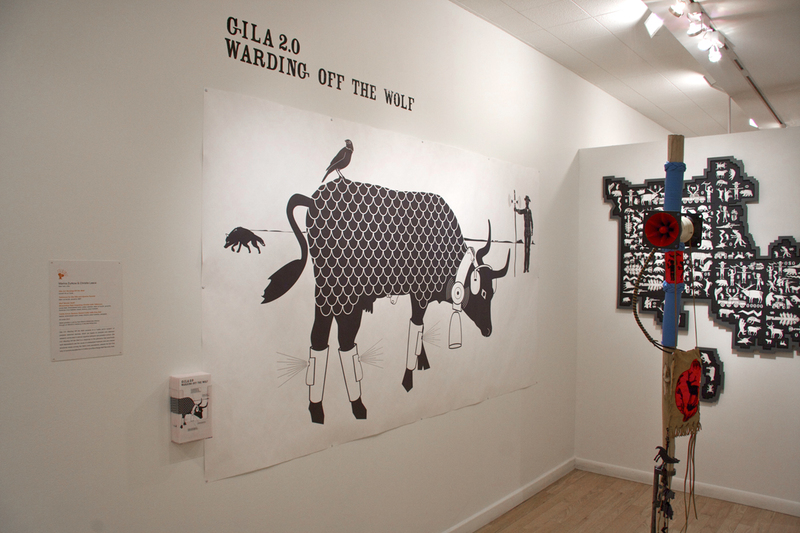 Gila 2.0: Warding Off the Wolf is a response to the grievance that wolf depredations are the cause of widespread livestock loss and intense emotional stress among the Gila’s rural populations. The histrionics around wolf predation are as outsized as the wolf’s storied reputation. 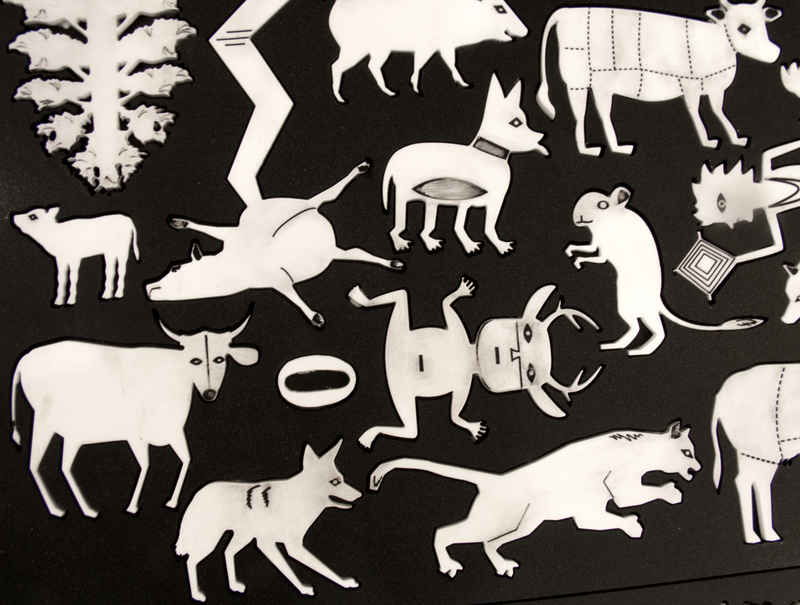 Sometimes wolves eat cows, but they are responsible for approximately 0.2% of all cattle deaths. Coyotes and domestic dogs account for the majority of cattle depredation in the U.S. About 95% of all cattle losses are due to non-predator causes, respiratory and digestive problems top the list (U.S. Department of Agriculture’s National Agricultural Statistics Service). As long as cattle and wolves share public lands, minimizing wolf interaction with cattle will ultimately benefit wolf populations, whether that is accomplished by a change in animal husbandry techniques, working with heritage breeds more suited to the desert ecology, or creating new human-animal relations via remote technologies. 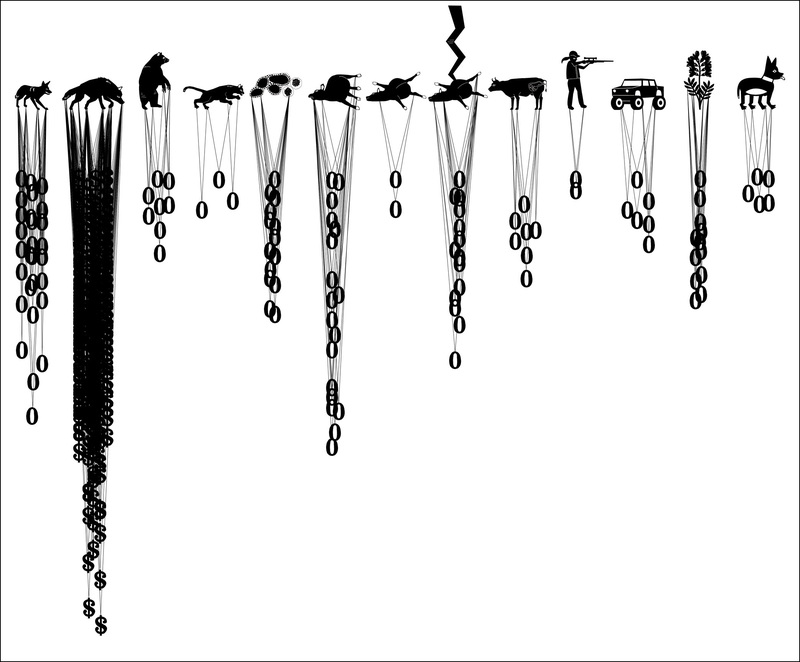 The design devices of Gila 2.0: Wading Off the Wolf are potentially useful for other predator species such as mountain lion, coyote, domestic dogs, and bear. The Gila National Forest, the Gila Wilderness, and the adjacent Apache Forest constitute the 4.4 million acre area known as the Blue Range Wolf Recovery Area (BRWRA). The Gila Wilderness was the first officially designated Wilderness in the United States in 1924. Aldo Leopold's ecological holism was born here while working for the U.S. Forest Service as a predator hunter. These forests and high desert grasslands support a host of fauna: mountain lion, black bear, coyote, white-tailed and mule deer, elk (reintroduced), abundant migratory and resident bird species (including the Spotted owl). They also support cattle. Ranchers homesteaded the Gila in the 1880s, and now utilize grazing allotments administered by the US Forest Service, which are rented at $1.35 a head (per cow and calf) per month; related costs of grazing on public land – fencing, water management, and predator control – are subsidized by tax dollars. Now, after a 40-year absence, there are also wolves. Following Richard Nixon’s landmark passing of the Endangered Species Act in 1973, the notion of “the environment” as we knew it changed. With the realization that species are nearing extinction, creatures large and small require protection by the U.S. Government. A dizzying array of State and federal agencies have to navigate the interests of animals, plants, loggers, ranchers, miners, and environmentalists. Everyone is angry, there are lawsuits and lug nuts loosened in parking lots to prove it. The Mexican gray wolf is the most endangered subspecies of wolf in the world. Twenty-five years after the enactment of the Endangered Species Act, eleven radio-collared Mexican gray wolves were introduced into Arizona’s Apache Forest area with the intent that the wolves would spread into New Mexico’s Gila (which they did). These wolves are federally designated as a “nonessential, experimental population” in order to afford the government more managerial flexibility in capture, monitoring and relocation. Federal public lands have many shoes to fill and mouths to feed. It is illegal to kill or injure a wolf, or even emulate wolf howls. In addition to its endangered status the wolf is a keystone predator, considered integral to the structure of a healthy ecosystem. There are currently approximately 58 wolves (34 radio-collared) in the BWRA. Recovery program redesigns, ranchers’ and New Mexico state government’s resistance, and illegal shootings have crippled the program’s goal of having a sustainable population in this vast area. Ranchers have suffered a difficult transition as members of the Gila ecosystem. 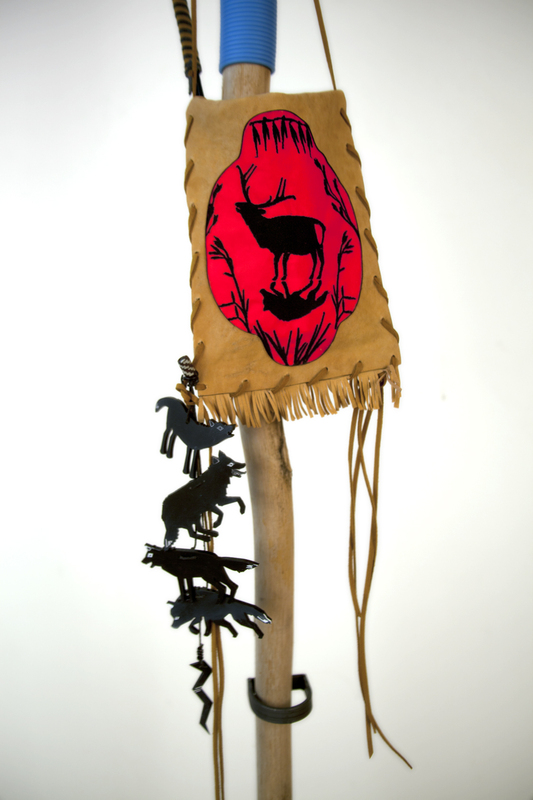 They see regulation as a steady winnowing of their rights, and the wolf has come to symbolize both real and mythical perceptions of attack. Ranchers originally attempted to rid the land of all predators competing for their meat, and ran at least five times as many cattle per acre than are now permitted on public land. The return of the wolf revives the symbolic burden of the European wolf-as-monster-or-Satan narrative, onto which ranchers then map the wolf’s recent associations with the Feds. 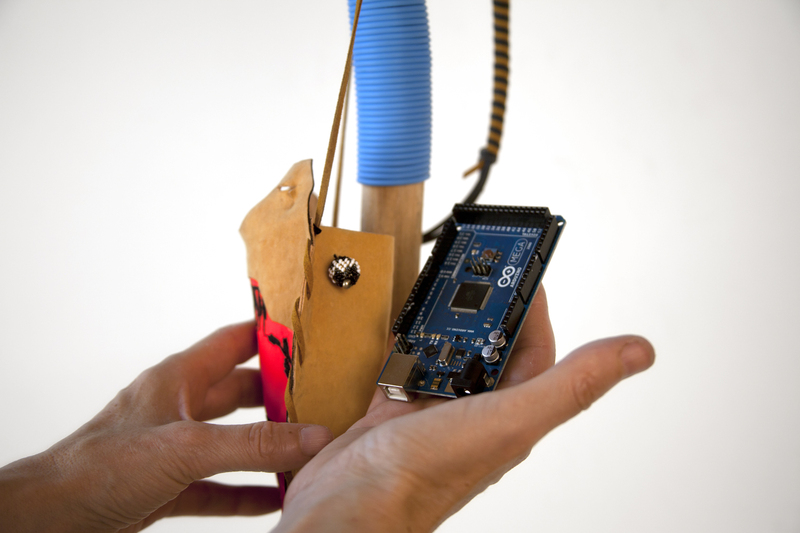 Within these shifts in the cultural and ecological landscape Gila 2.0: Warding Off the Wolf employs technology and design as a platform for research and dialogue, investigating the current state of the ecosystem and how it might be transformed. 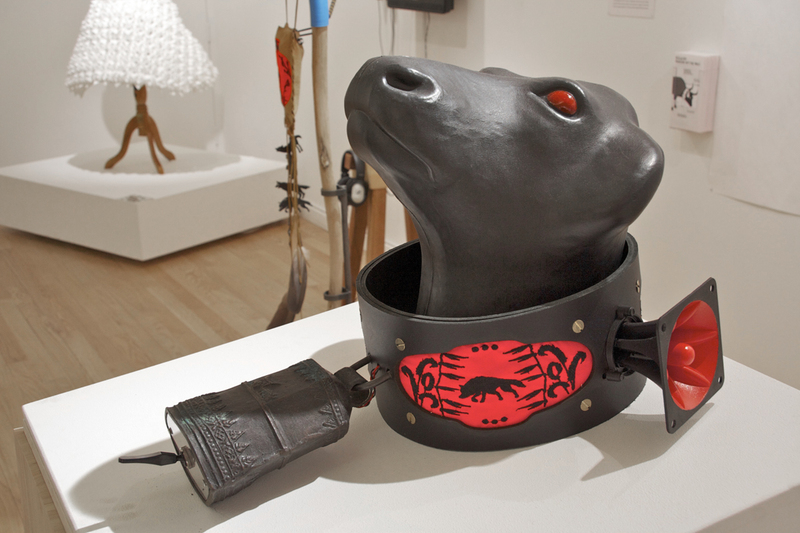 Leather, embroidered nylon, brass, Arduino, piezo tweeters, plexiglass. 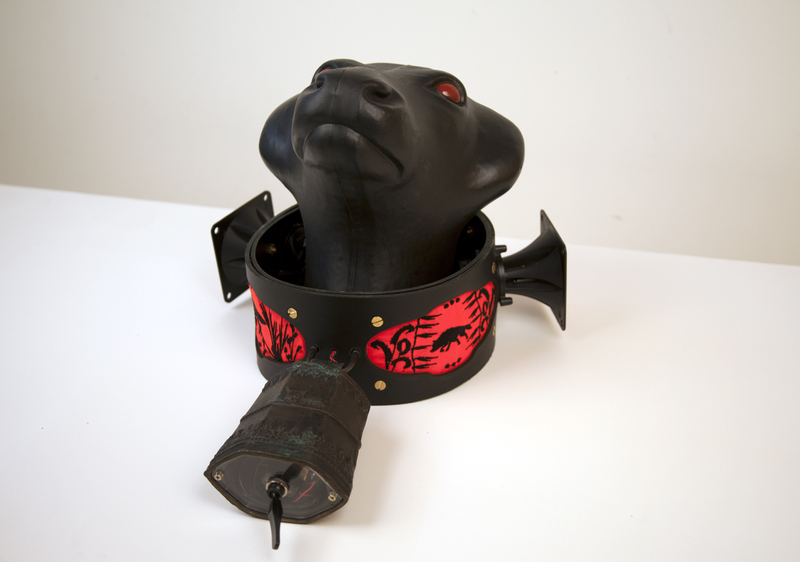 Description: Collar continuously plays a variable soundtrack of sound effects, music. Biologists advised against the quick wearing off of novelty for intelligent predators. Iin the words of John Shivik, mammals coordinator, Utah Division of Wildlife Resources, "Keep it weird. The weirder the better." 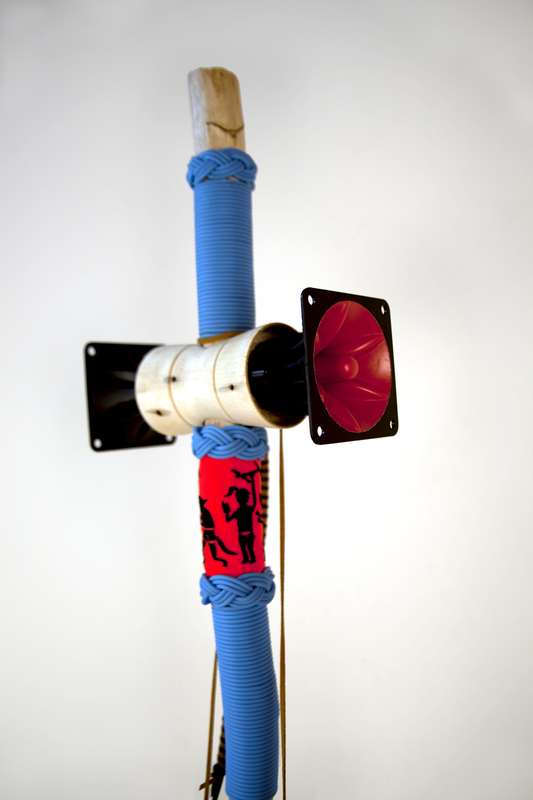 Intended for calves. 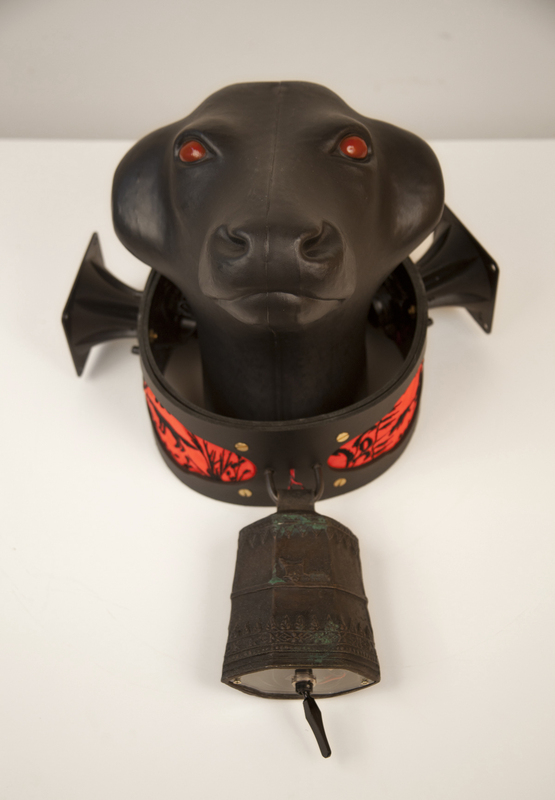 Listen to the Sound Collar here. 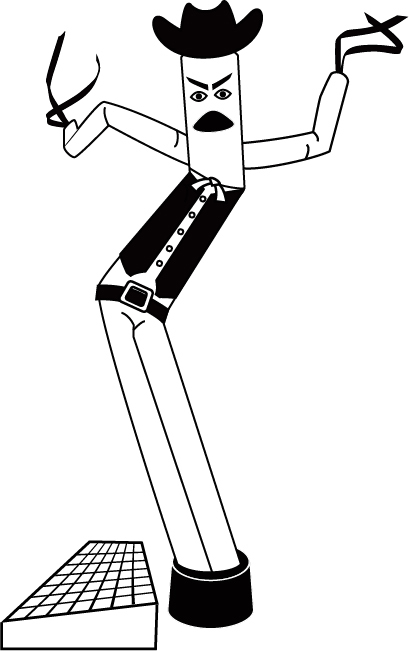 Unique prototype Description: Walking staff emits continuous high frequency pitches, inaudible to humans, at variable kHz which are painful to predators and within their hearing range. 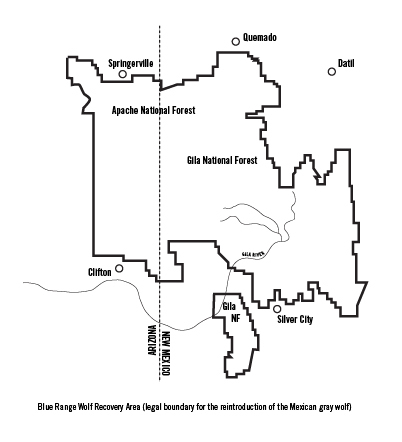 Description: Map of the Blue Range Wolf Recovery Area, 4.4 million acres spanning the southern New Mexico/Arizona border. 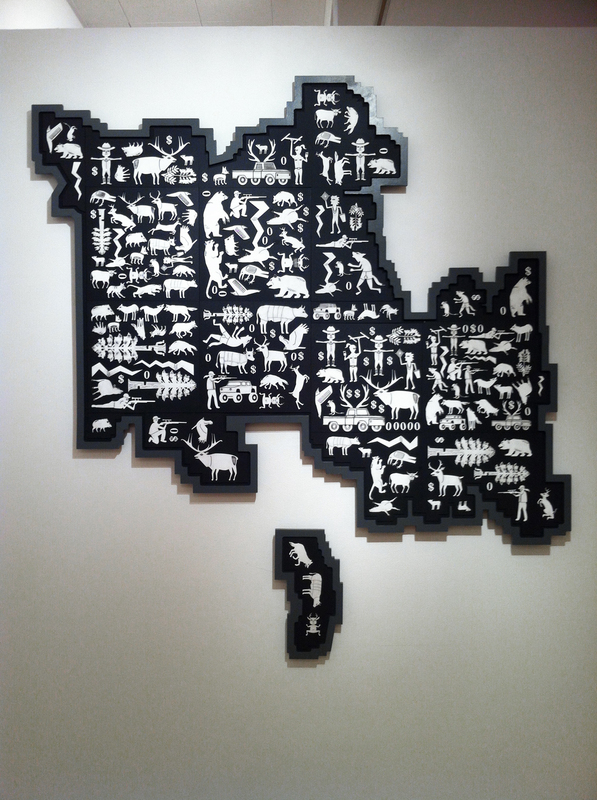 This map, a mosaic of laser cut and paint-treated pieces depicts the various players in the high desert ecosystem: ranchers, hunters, hippies, biologists using radio telemetry, SUV's and pick up trucks, lightning, cattle, Ponderosa pine, javelina, elk, deer, wolves, mountain lion, bears, Mimbres pottery hybrid creatures, mythological wolfmen, ravens, vultures, mice, and money. 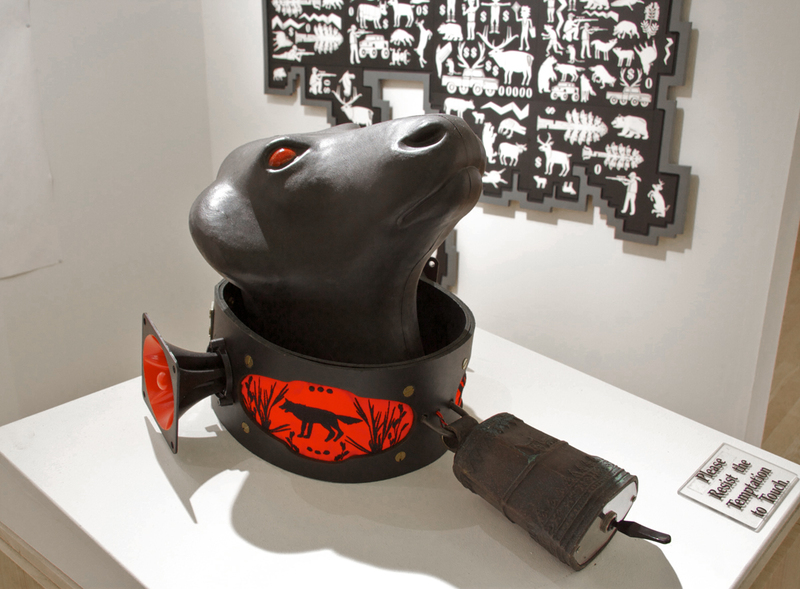 Description: oversized print depicting the armor system, an ironic play on defending one's property by employing technologies useful in self-defense, deterrence and surveillance. Under the Endangered Species Act, the introduced Mexican gray wolf is a federally protected animal. Ranchers whose livestock is subject to depredation by the wolves are entitled to compensation of $1500 per cow. The Fish and Wildlife Service (FWS) reports annually on the number of ranchers' claims versus FWS' verified wolf depredations. 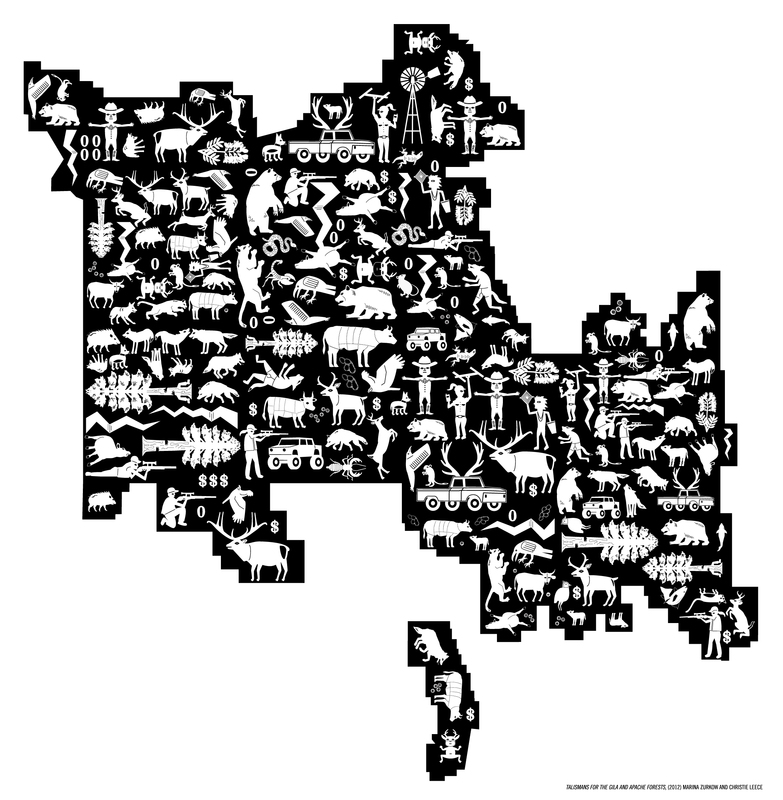 Looking at available FWS reports from 2005-2010, we charted all the causes of death which were submitted as wolf-caused: lightning strikes, bloat, vehicle and gunshot deaths, disease, birth complications, poisonous plants, bear, mountain lion, coyote, domestic dog, and unknown causes. Only verified wolf depredations afford financial remuneration by the government, while the other causes of livestock death are a zero yield.